The Finnish Footbag Association and the beautiful city of Helsinki are this year’s host to the annual IFPA World Footbag Championship tournament. Together with the International Footbag Players’ Association and an event production company specialized in urban sports and arts, an experienced team of FFA members are organizing the event. Their goal is to deliver the best Worlds yet — for competitors and spectators alike. 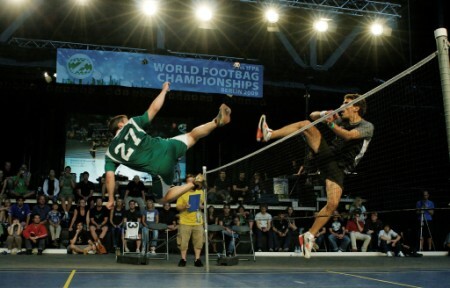 This is the second time for the Helsinki footbag scene to organize the World Championships. In 2005, Emmanuel Bouchard and Vašek Klouda dominated the sport, both claiming multiple titles at the Helsinki Sportshouse. In six years, both the level of play and the number of top-level players have risen considerably: there will be no shoo-ins in any event. Emmanuel Bouchard faces Florian Götze in the 2009 IFPA World Championship final. Photo by ~Phipson~. Some rights reserved. For the first time in footbag history, the tournament will take place on a former Olympic arena. Starting on the 31st of July, Töölö Sports Hall in downtown Helsinki is expected to welcome more than 200 players from five continents to one of the most unusual and captivating athletic competitions of the year. During the week, athletes representating France, Germany, the USA, Venezuela, Japan, Australia, and many other countries rival in various footbag disciplines for a place in the Saturday (6th of August) finals. So mark down the dates, start booking those flights, and join the biggest footbag event of the year! Remember also to subscribe to all of our tournament news and updates.